Every so often you find a place so good you don’t want to share it with anyone. 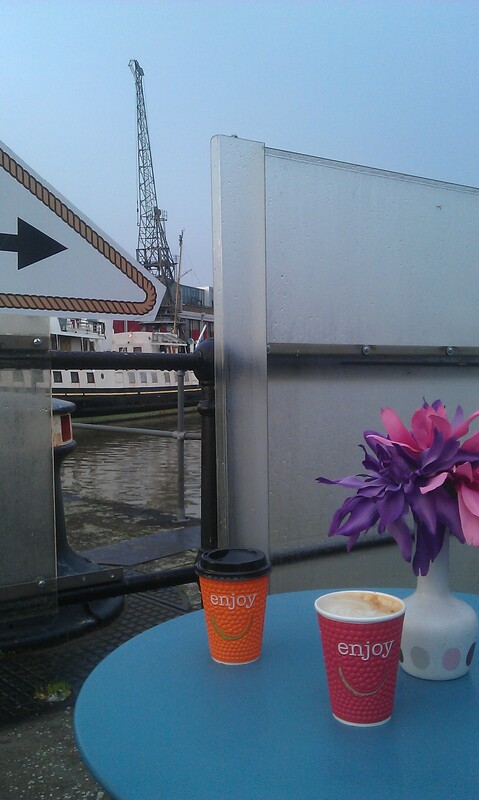 But, in the spirit of intrepid brunch hunters the world over, I’m duty bound to write about a tiny and terrific place on the bridge that links Bristol north and south – the Smallest Coffee Cabin in the World™ – that manages to pack more personality, quality and service in its wardrobe-like proportions than a thousand Starbucks could ever hope for. Nestled on the Prince Street Bridge, it looks right down the harbour, past the famous cranes and steam trains to the left, the bustling waterfront with its plethora of canal boats and passenger ferries on the right. One tiny table and two chairs, replete with vase of flowers, are squeezed onto the pavement and there’s just enough room indoors for two or three (depending on your full-fat-or-skinny preference) when the wind picks up. Inside it’s like a nautically themed Broom Cupboard – mercifully duck-free – with curios that hang from the walls and line the shelves; the menu is chalked up behind the bar and your barista is dressed in full chef whites. Those in the know had already texted their orders ahead, and it’s clear it has its fair share of regulars, all here for one thing – the coffee. There’s a house (or hut?) blend and a weekly guest coffee and each order is made with care. This is a place in no hurry, but you can while away your time reading the ‘Facts of the Day’ or, if you’re lucky, spinning an old Game of Life wheel for a freebie. Once ready, the coffee is a treat. My house blend was a smooth, subtly syrup-y delight, with just the right amount of dark chocolate bitterness and the perfect coffee-to-milk ratio for a proper latte; there are soya options and flavours to add, too (their hazelnut mocha is legendary). This is the ideal place for busy folks in need of an early morning pick me up, and there’s food on the go in the form of freshly made crepes with all the fillings you could hope for or homemade tiffins and flapjacks. The service is sublime, and, better still, there’s a discount before 10am to make those dark winter mornings all the brighter. Go forth and be happy. Price: from £1.80 (latte, before 10am).